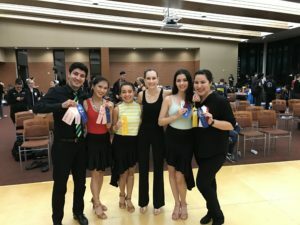 The Notre Dame Ballroom and Latin Dance Club competes in numerous collegiate dancesport competitions throughout the year. 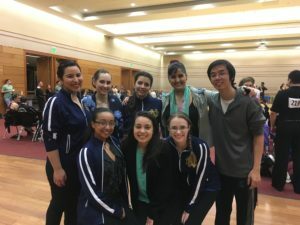 We travel to colleges around the Midwest including University of Wisconsin in Madison, Ohio State University in Columbus, and Valparaiso University. 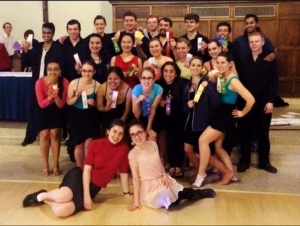 We also host our own annual competition, the Irish Dancesport Gala, late in the spring semester. We welcome our members of all levels to compete as part of the competition team. Opportunities to go to competitions that the club will be going to as a team will be sent out in the form of surveys our weekly emails. Please fill them out and we’ll take care of everything else from registration to housing to transportation. If you’re on the fence about whether to go, speak to an officer and we will happily discuss with you and should you decide to go, guide you through the process. After this, all you need to do it PRACTICE, PRACTICE, PRACTICE!